In only a few seasons Prada has managed to take something as traditional and classic as the wingtip brogue and spin it into an avant-garde accessory which says a lot about its wearer without defining him. As much as I loved the espadrille platform and the foam one that followed I honestly didn't think people would wear them through the seasons. But I guess that if anyone can transform a trend into an icon that is Prada. Now the brand has released the 'Levitate' shoe, which exposes a jogging trainer-like platform sole through a see-through cover. So you can run to work in these and it will look like you're sort of flying. Thing of them as 21st century Hermes – the god, not the brand – sandals. The new platform style comes in different colour combinations and shoe models some of which you can check out here on the Prada website. The new style is also surprisingly affordable – having in mind you're buying Prada. 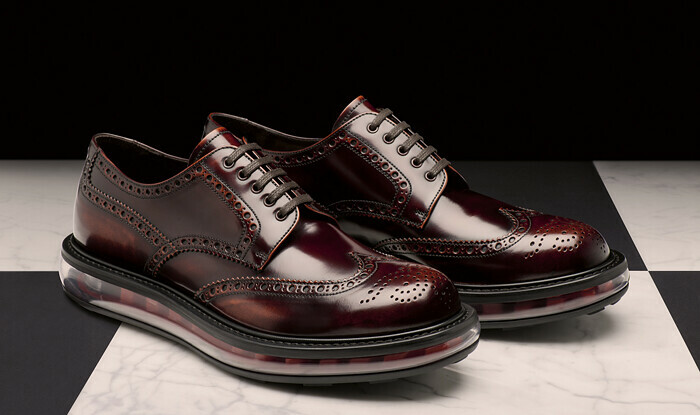 My personal favourites are the classic maroon brogues above and the same model in black.